Beautiful shades of purple. Sweet, fresh smell of springtime. 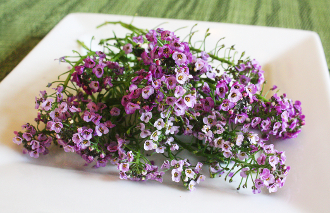 Tiny flowers, delicate in appearance with green stems attached. Decorate seafood plates & fruit platters. Perfect for adding beauty & aroma to a warm weather cocktail.